MC 9090-G - Empowering mobility! 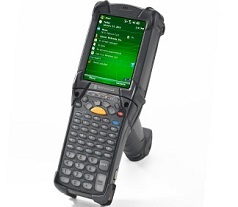 Designed for workers inside your four walls, the MC9090-G offers advanced data capture options and integrated wireless LAN/PAN plus a comfortable ergonomic pistol grip to enable real-time data collection in scan-intensive environments — in the warehouse, on the loading dock, out in the yard, and in the back room or out on the sales floor of a retail operation. Maximizes the value of your applications — and software development investment.